Two (2) New Aftermarket Replacement John Deere 6 Bolt Front Wheel Hubs (7/8 Thick) for Tractor models: 2510, 2520, 3010, 3020, 4000, 4010, 4020, 4030, 4040, 4230, 4320, 4430. Painted in John Deere Yellow. Hubs include: Twelve (12) Hub Bolts, Part # 518611M1. Front wheel hub bolts, tapered, 9/16 x 1 threads, 1-9/16 total length. Thread: 9/16-18 Dim (1) A: 7/8 Dim (2) B: 1-9/16 Dim (3) C: 90° SECOND PICTURE IS OF ACTUAL HUB & BOLTS. Pictures shown are of two (2) different styles of Hub, they are the same part and fit the same models. They are made by different manufactures. Replaces Part Number: R48763W-BOLTS x 2 (which consists of Two Hubs -- R48763 x 2, and 12 Lug Nuts -- WB916 x 12). Reliable Aftermarket Parts is in not affiliated in any way with OEM manufacturers. All OEM part numbers and logos are to be used for identification purposes only. We carry parts for Engines, Transmissions, Front & Rear Axles, Hitch & Drawbars, Undercarriages, Final Drives, Seats, Bearings, Cups, Cones, Seals, Discs, Couplers, Gears, Brakes, Pressure Plates, Pilot & Throw Out Bearings, Ring & Pinions, Gaskets, Decals and MORE for most high wear items. We also carry replacement parts for the Boom Cylinder (Seal Kits, Tubes, Glands, Pistons, Rods). 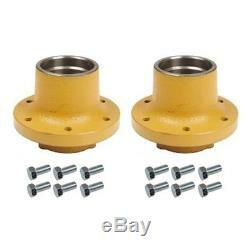 The item "Two (2) R48763 John Deere 6 Bolt Front Wheel Tractor Hubs 3020 4010 4020 4430 +" is in sale since Thursday, May 22, 2014. This item is in the category "Business & Industrial\Heavy Equipment, Parts & Attachments\Heavy Equipment Parts & Accessories\Tractor Parts". The seller is "reliableaftermarketpartsinc" and is located in Williamston, Michigan. This item can be shipped worldwide.